Known for small, low-priced processor boards, Gumstix recently announced Pepper, its first single board computer for the embedded systems market. 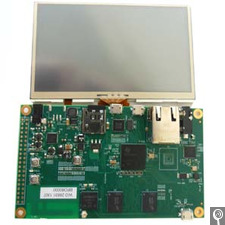 The module is designed around the Sitara AM3359 ARM Cortex-A8 processor from Texas Instruments and features 512 MB of DDR2 memory, 802.11 b/g/n wireless networking, Bluetooth 3.0, a microSD card slot, audio connectivity, a console port, and two USB on-the-go ports. Pepper also offers a 4.3″ LCD touch screen, expansion headers for interface applications, and GPIO-controlled push buttons/LEDs. The module also supports the open source software Yocto Project with tools and templates to help designers create custom Linux-based systems for embedded products.